The blast struck as Egypt's Coptic Christian community marked Palm Sunday. 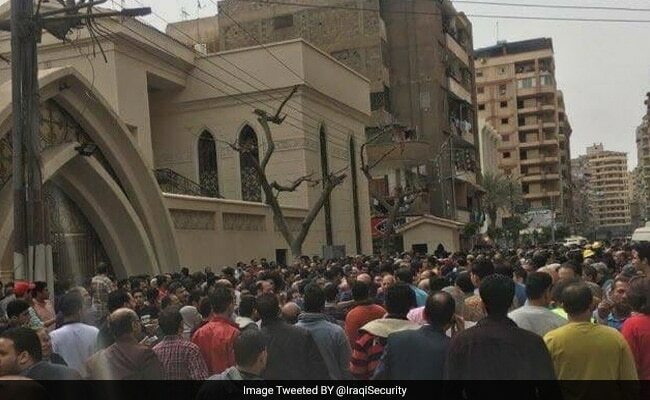 Cairo: A bomb blast at a church north of Cairo killed at least 21 people and wounded dozens who had gathered for Palm Sunday mass, state media reported, in the latest apparent attack on Egypt's Coptic Christians. Some 59 people were wounded in the blast, which struck at a Coptic Church in the Nile Delta City of Tanta, 120 kilometres (75 miles) north of Cairo, the reports said. A medical official at a hospital in Tanta confirmed to AFP that at least 13 people had been killed. Palm Sunday is one of the holiest days of the Christian calendar, marking the triumphant entrance of Jesus to Jerusalem. The state-run Nile television channel said the blast struck the Mar Girgis Coptic Church in Tanta just before 10:00 am (0800 GMT). Provincial governor Ahmad Deif told the channel that at least 59 people were wounded and that the explosion occurred inside the church. "Either a bomb was planted or someone blew himself up," Deif said, adding that security forces had searched the church and surrounding areas for additional explosive devices. There was no immediate claim of responsibility for Sunday's blast. Terrorists and Islamists accuse them of supporting the military overthrow of Islamist president Mohamed Morsi in 2013, which ushered in a deadly crackdown on his supporters. In December, a suicide bombing claimed by the ISIS group killed 29 worshippers during Sunday mass in Cairo. A spate of terrorist-linked attacks in Egypt's restive Sinai Peninsula, including the murder of a Copt in the city of El Arish whose house was also burned, have led some Coptic families to flee their homes. About 250 Christians took refuge in the Suez Canal city of Ismailiya after ISIS released a video in February calling for attacks on the religious minority. Egypt's army is waging a counter-insurgency against an ISIS affiliate in Sinai, which has claimed scores of attacks against police and army positions. President Abdel Fattah al-Sisi, who as army chief helped the military to remove Morsi, defended his security forces in a televised address soon afterwards. "(The attacks aim to) destabilise the fabric of Egypt... to give the impression that one group isn't protected as it should be," Sisi said at the time. Following Morsi's ouster, mobs attacked dozens of churches and Christian properties. Pope Francis is due to visit Cairo on April 28-29 to show solidarity with Egypt's Christian community. The pontiff will visit the site of the December church attack next to Saint Mark's Coptic Orthodox Cathedral -- the seat of Coptic Christian Pope Tawadros II.